It appears from this video that Khloe has a secret crush she is hinting at, but not giving us all the gushy details on. Well, we have that in common, and clearly the fact that we both need sparkle in our lives all day erryday. Like you might remember from this background freebie post, #ineedsparkle! But what I really wish we had in common were those Loubis in the video! Or what I like to refer to as, fabulocity in a box! But alas, I do have these shoes from back in the day and they are a close second to the Louboutins right??? Maybe one day, when I'm filthy stinking rich, I'll give a pair of Loubis a great home to come and live in! So I've obviously spilled the beans with a little more detail about my secret, CB, but what do you think Khloe's secret is that she is keeping from us? Who or what do you think is Khloe's sparkle crush? Personally, I hope the unicorn is involved somehow! Well we will all have to wait until September 25th, because that is when the second video will be posted, and Khloe will make the big reveal on the I Need Sparkle Youtube channel! Those shoe are beautiful. I would also love to buy some Loubs. oh my gosh i love the kardashians so much it is a sickness. especially khloe. and THOSE SHOES. I'm totally not a shoe person, but I have to say I LOVED my Madden Girl Gettas that came in (multi-colored) gold sparkle way back in 2012. 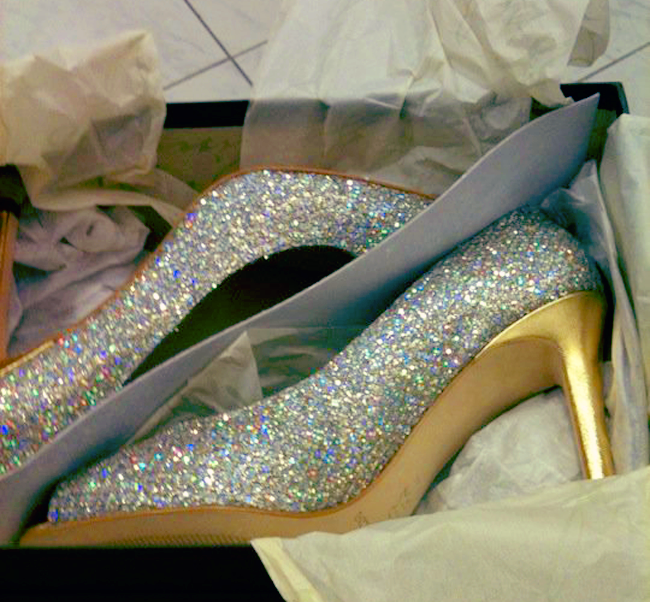 They were perfect wedding shoes, and I'm holding onto them for future sparkle-appropriate events.